Mathematics and science education reforms encourage teachers to base their instruction in part on the lesson as it unfolds in the classroom, paying particular attention to the ideas that students raise. This ability to adapt instruction in the moment requires that teachers be able to notice and interpret aspects of classroom interactions that are key to reform teaching. This paper defines what it means to “notice” in the context of reform and describes a multimedia tool designed to help teachers learn to do so. The authors then report on a study in which six mathematics and science teachers seeking secondary teaching certification used the software to examine teaching. The results suggest that use of the software helped the teachers to develop new ways to analyze instruction. Specifically, the teachers began to identify particular events in their classroom interactions as noteworthy, to more frequently use specific evidence to discuss these events, and to provide their own interpretations of these events. This research adds to our understanding of teacher cognition and also has implications for those who are designing and implementing teacher education in the context of reform. van Es, E.A. & Sherin, M.G. (2002). Learning to Notice: Scaffolding New Teachers’ Interpretations of Classroom Interactions. 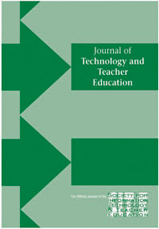 Journal of Technology and Teacher Education, 10 (4), 571-596. Norfolk, VA: Society for Information Technology & Teacher Education. Retrieved April 21, 2019 from https://www.learntechlib.org/primary/p/9171/. Abdal-Haqq , I. (1995). Making time for teacher professional development (Digest 95-4). Washington, DC: ERIC Clearinghouse on Teaching and Teacher Education. American Association for the Advancement of Science . (1993) . Benchmarks for scientific literacy. New York: Oxford University Press . Marx, R., Blumenfeld, P.C., Krajcik, J.S., & Soloway, E. (1998). New technologies for teacher professional development. Teaching and Teacher Education, 14(1), 33-52. Shulman, L. (1996). Just in case: Reflections on learning from experience. In J.A. Colbert, P. Desberg, & K. Trimble (Eds.) , The case for reflection: Contemporary approaches for using case methods (pp. 197-217). Boston: A l lyn & Bacon.